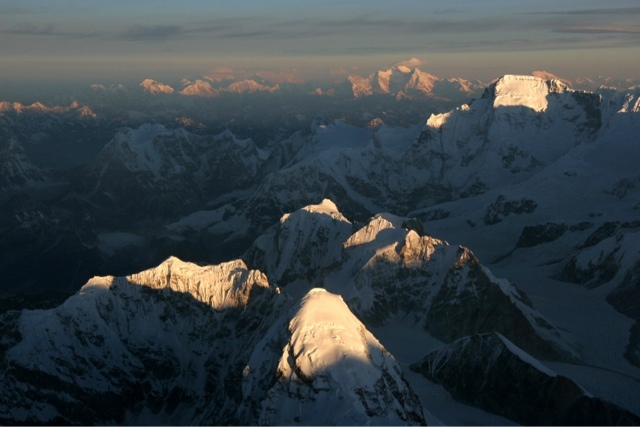 Everest … here we come! Intrinsically I am going back to Everest to lead a group of 6 trusty experienced mountaineers aiming for the summit. 5 of us are taking a leisurely 3 weeks to trek in to Everest Base Camp and I’ll be taking them over 3 high passes along the way. We’re crossing The Renjo La, The Cho La and, after a couple of days resting at Dingboche, we’ll be crossing the Kongma La as well. We will be sleeping a few hundred meters below each pass – the idea being that we are spending time at higher and higher altitudes prior to arriving at EBC. We are also ascending a peak called Pokalde as part of our acclimatisation which is just short of 6,000m. When we arrive at Base Camp we will be joined by our final member – a fellow expedition leader I have worked with a few times – and then we will start our acclimatisation rotations on Everest. This involves going through The Khumbu Icefall which has a bit of a reputation. It is a like being in a maze with ice walls (seracs) towering all around. Some areas are perfectly safe and other areas are places where you wouldn’t want to stop and take a picnic. Other teams will go in, come out, go in and up to deliver gear to Camp 1 (around 6,000m) and back down again and then they’ll go and sleep at Camp 1 and then onwards to Camp 2 (6,400m). Because we will have spent 3 weeks acclimatising elsewhere it means that we can go straight through and sleep at Camp 1 on our first visit – so lessening the journeys, the nervous energy and the exposure to risk. At least that is the plan! Last time it worked really well and there’s no reason why it won’t work out that way again – the main thing beyond our (my) control here is the health of the group but all being well we will be sleeping at Camp 1 and then on to Camp 2 on our first rotation on the hill. After a few days loitering at C2 we’ll drop down to Base Camp for a few days to rest and recuperate. No matter how hard we try, and no matter how efficient we are with our time, when we are on the hill we won’t eat enough, we won’t drink enough and we won’t sleep enough. There is only so long that you can go in to deficit before it starts to impair performance and judgement. Indeed if someone becomes seriously dehydrated it can lead to other complications making people much more susceptible to frostbite, hypothermia (too cold), hyperthermia (too hot – it can be in the 30s in The Western Cwm and if we are too slow and get caught in there in our down clothing it is difficult to regulate the core temperature and cool down), Acute Mountain Sickness and the two killers that everyone wants to avoid – High Altitude Cerebral Oedema (fluid on the brain which can affect brain function, decision making ability, eyesight, balance and coordination) and High Altitude Pulmonary Oedema (fluid on the lungs which affects the ability to breathe. It is difficult enough breathing up there anyway without having fluid sloshing around in your lungs making them less efficient). So it’s back down to Base Camp to rest, eat and drink. At altitude, perversely, people often lose their appetite (again isn’t it difficult enough already) so I always provide loads of extra snacks, nibbles and delicacies to make Base Camp a more appealing environment. We’ve got boxes of Haribo, Licquorice Allsorts and other sweet and sticky goodies, loads of crackers with cheeses and pate, tubs of Pringles, bags and bags of cashews and pistachios, jars and jars of olives and gherkins and, my latest find which I’d never come across before, caperberries They are basically stalks with capers on pickled in a jar. It’s all very well having chocolatey and sweet snacks but it’s savoury that everyone tends to crave. But it’s not all chilling and resting. I’ll also be conducting the final few sessions of instruction and preparation for the group. On the trek in we will already have discussed topics such as avoiding frostbite, how to prevent getting cold hands, dealing with fixed ropes in ascent and descent, the importance of concurrent activity and the like but at Everest Base Camp, where it is most tangible, I start covering the really serious stuff with oxygen protocols,medical protocols and stuff relevant to summit day. We are one of the only teams who will spend time practicing how to draw up injections. We have some strong steroidal medicine which can saves lives and buy time for that person to descend. Speak to most people on the mountain and they’ll know the drug – Dexamethazone. But ask them the dose they should give, what it can be taken with, what the dangers and pitfalls are and, most importantly, how and where to inject and they will probably look a little bit sheepish. It is a life saver but people don’t know how to use it. Trying to talk someone through how to give an injection on the end of a radio is nigh on impossible, so we have a go in the relative comfort of Base Camp just in case we have to do it for real in a life and death situation on the hill. We are, to the best of my knowledge, the only team where every member will be equipped with their own personal supply of high altitude medication and, importantly, know what it is for and how to use it. With the oxygen masks everyone in the team will know how the masks adjust, how it links to the regulator, how the regulator attaches to the bottle and what duration they can expect depending on the flow rate. For many teams the first time they try with their mask is at Camp 3 (7,100m to 7,300m) and if they don’t get it right, or can’t operate the system properly, then it could well affect their summit bid or even their life. Or the lives of those around them. I do have a bit of a bee in my bonnet about people turning up ill prepared or not knowing their gear and equipment intimately because, at the end of the day, it is The Climbing Sherpas who are going to go out and try to rescue these folk. I have been working with my Sherpas for a decade and they have families and responsibilities so how would they feel if I brought along a client who clearly shouldn’t be there? How would I feel if one of them became injured in some way because one of my clients shouldn’t have been there in the first place? So the next foray on the hill is straight to Camp 2 and we will ascend to, and ‘touch’ Camp 3. There’s no need to spend time there if we don’t have to – so we spend a few hours there and then back to Camp 2. After that we are back to Base Camp waiting for the weather and when the window appears we will be in for a 7 or 8 day journey to the summit and back. Watch this space and I hope that you enjoy the show! Counting down and it’s the last full day in the UK before I jet to Nepal and meet my trusty team for our forthcoming Everest expedition. Most of the stuff is in place – just a few last minute things to do like pick up the last of the medicines I have ordered, have a FaceTime chat with a chap in Australia, go to the bank, cancel a Direct Debit, sort some currency, e mail Nepal (again), find my passport and tickets, e mail some of my Ama Dablam clients for their forthcoming trip this November (limited spaces available folks), get some photos printed off for when I arrive in KTM, find my Nepal mobile and charger, collect some deliveries that are (hopefully) going to Needlepsorts later today, buy a wireless mouse, pop some patches on some salopettes to stop the down leaking, finish packing, collect the kids and then spend some quality time with them before bath, books and bed time. Oh, nearly forgot, there are guests staying at the B&B so I have to clear the dining room, load the dishwasher, hoover the hall and stairs, tidy their room and pop some new towels in for them as they are here for 6 nights. Whilst I’m at it I may as well put the washing in the dryer and get a new wash on. But apart from that I’m all ready. First things first – I’m off for a coffee! 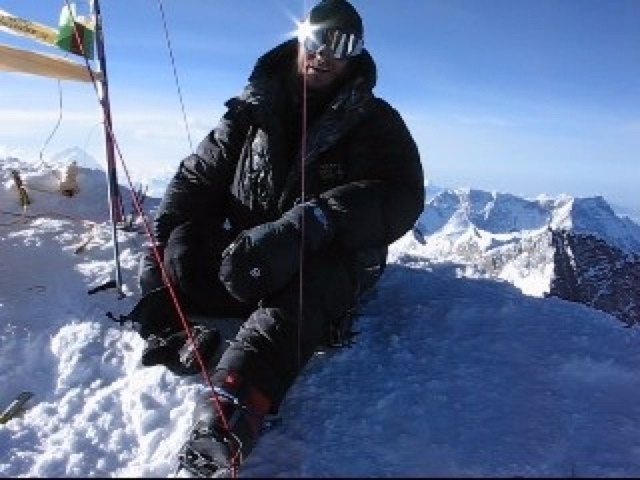 A random collection of photos from Everest 2005 and 2011. Partly because I’m testing the Blogger app. If it works there’ll be more to follow later this season. Exciting times! A week today and I’ll be travelling to Nepal and meeting up with my illustrious group of would be Everest summiteers. They all have great potential and there is absolutely no reason why we shouldn’t all be standing on the summit – maybe even together. Suffice to say that I only take people who are suitably well qualified by experience … and these guys and gal are all suitably well experienced. I have worked with Adam, Ilina, Steve, Stuart and Jon on Ama Dablam and I have been out quite a few times with Tom in both summer and winter conditions. It has the makings of a great team and a fun trip. Just as we did in 2011 we’ll be taking a leisurely 3 weeks to trek to Everest Base Camp and the aim is to arrive fit, healthy, acclimatised and well bonded. We’ll be sleeping just below, and then crossing, 3 passes that get progressively higher and then ascending Pokalde which is a tad below 6,000m. Then it’s time to arrive at Base Camp, settle in, get sorted and start the acclimatisation rotations on the big hill. Having crossed the passes and climbed a peak during the trek in we’ll be able to spend less time toing and froing through the Khumbu Icefall and we’ll be sleeping at Camp 1 (6,000m) on our first visit followed by a couple of nights at C2 (6,400m). After a couple of rest days at EBC our next visit on the mountain will be straight to C2 and then a foray to ‘touch’ C3 (7,100m to 7,300m depending on where it’s situated) and then back down again (a 4 or 5 day foray). And that’s it – we’ll be ready and waiting for the summit weather window. Oh, I forgot to say – along the way we’ll also be discussing topics such as how to avoid frostbite, what causes hypothermia and how to avoid it, the importance of hydration, the benefit of concurrent activity, how to assess risk whilst keeping moving in The Khumbu Icefall, medical protocols, how to draw up an injection (whilst wearing BIG mitts), where to inject people should the need arise, oxygen protocols, radio procedures, how to deal with fixed ropes in ascent and descent, how best to pass people on the lines etc etc. We will also be discussing the very distressing subject of dealing with death on the mountain. Unfortunately people die every year on Everest … and I am going to stick my neck out here and say that most of those deaths were avoidable. Not necessarily avoidable on the day, mind you. But they were probably avoidable well in advance in the respect that if the clients had been better prepared before arriving to attempt Everest, or that they had come up with a sensible training regime and identified what skills they required (and accomplished all those objectives to a very high degree), or that they had a better overall grounding in being an independent mountaineer in their own right from prolific experience in the hills and on expeditions, or that they had practiced with their kit and equipment before using it in the summit day environment (oxygen systems for instance), or that they had showed better (or even in many cases, some) due diligence in their choice of expedition provider. 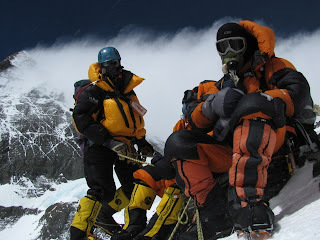 Or that the expedition provider they had signed up with had more oxygen, spare oxygen, that they had high altitude medicines on summit day (and the knowledge of how to best use them), that they had better Climbing Sherpa ratios, a better grasp of logistics on the hill, clearer lines of communication, etc etc. In all those respects and if all those criteria had been fulfilled then I’m afraid to say that many of the deaths on Everest were avoidable. Let’s hope it’s going to be safe and successful season all round. There’s a lot that is beyond our control, mind, so we are definitely prepared to give it our best shot but without feeling that we are somehow invincible. It’s an environment that demands a lot if respect. We’ll try and keep the posts coming but it’s not always that easy. If anything the easiest option out there is tweeting and sending FaceBook updates so have a look at timmosedale on twitter and tim.mosedale on FaceBook and we’ll try and keep a steady stream of updates. Thanks for following and showing interest and hopefully we’ll get some summit shots, videos and movies to show you at the end if it all. 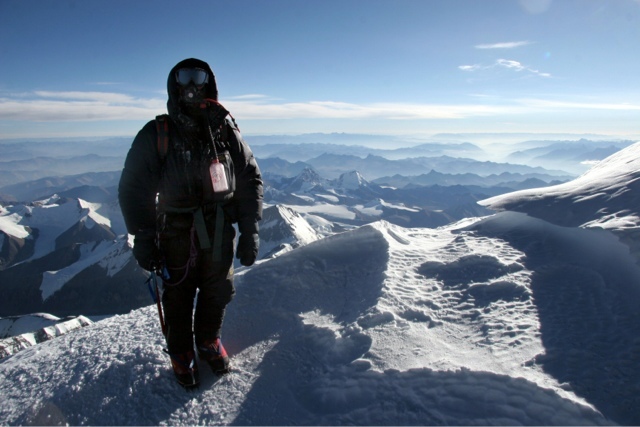 Now then … please please remember that not all Everest trips are equal. We have an expression over here that goes something along the lines of ‘If you are going to compare apples with apples, at least make sure that you start out with apples.’ So, whilst there are some exceedingly expensive trips available, there are also some that are way too cheap. And you have to ask yourself why they are cheap and what you aren’t getting. For instance, there are deals out there for around US$35,000 to US$38,000 – but what people don’t realise is that this price might not include Climbing Sherpas, oxygen, masks, regulators, food and accommodation on the trek in etc etc. Other aspects where teams cut corners are the Base Camp facilities, provisions on the hill, weather forecasting, a Western leader and the quality of their Climbing Sherpas. How on earth can people spend that amount of money having not researched what they are, and are not getting, and end up paying through the nose for various add ons that potentially increases the final bill by another US$10,000? The expensive trips may well be recouping some of their overheads that they incur with office staff, glossy brochures, networked computers and company cars. But all this does not count for anything when you are on the hill because the brochure, networked computers, office staff etc are a complete irrelevance. What counts on the hill are the Base Camp facilities and quality of the food, the logistics, the Climbing Sherpas, the weather forecasting, the provision of oxygen and the leadership. So, firstly, I use one of the best agencies in Kathmandu. They are a VERY good operator and have an extremely proficient team, particularly when it comes to rescue and evacuation. This is something that we always hope we will never have to call upon – a bit like having insurance. But, like insurance, when you do have to call upon it you want to know that you are with one of the best providers. Kame (left) is one of the best Sirdars on the hill and Bhim is one of the best Base Camp cooks. Similarly I use one of the best Sirdars on Everest. He is very well respected amongst the Climbing Sherpa community, he is held in very high regard amongst Western leaders and his team of Climbing Sherpas are some of the strongest on the mountain. Just because Climbing Sherpas have summited Everest numerous times doesn’t necessarily make them good at their job. Yes they may well be immensely strong on the hill but the Climbing Sherpas we use are not only strong but they are also attentive to their job and have a greater understanding about client’s expectations. We are also in the right camp with our supply of oxygen. We don’t just have a limited supply of oxygen and once you have used your quota it’s gone – we have an ample supply with enough extra to cater for contingencies. With other teams when it’s gone it’s gone (or you have to buy more) whereas with our team there is a generous allocation to allow for unforeseen eventualities and emergencies. If, say, we got delayed at The South Col because the weather changed then this would not jeopardise our summit attempt. Equally if you were forced back on summit day because of a broken crampon, or helping out some other team, this too would not jeopardise your summit bid. With other teams once you have used your allocation (for whatever reason) then you either have no more gas or you have to spend more money. Again, we hope that there won’t be any emergencies happening … but if there are, then we are with the best. and acclimatisation for our arrival at Everest Base Camp. I know that most of the cheaper trips (and indeed some of the really expensive one) don’t include things like meals in Kathmandu, or teahouse accommodation costs when trekking in, or extra snacks and goodies at Base Camp. To that end I am providing you with more for your money. I know that you might think that these don’t amount to much in the great scheme of things but there is also my 3 week trekking itinerary to take in to account. This is a great part of the trip that allows for us to have a massive amount of flexibility and incorporate a few high camps before a few days resting at Dingboche (all paid for of course) and then another high camp (which is higher than Base Camp) as well as a 5,800m peak. This means that when we arrived at Base Camp last Spring everyone was fully acclimatised (not a headache in sight), very fit and healthy (we had avoided all the ill trekkers) and everyone was bonded as a group which not only made for a more pleasant experience but also a safer more dynamic team on the hill. Once we arrived at Everest Base Camp we went in to the Khumbu Icefall for a half day foray on the ropes and ladders. The next time we went through was to sleep at C1 and then go on to C2! This is quite unusual as most teams make about 3 journeys before being ready to sleep at C1 – which meant that we spent less time and energy getting ready for the big event. The next time up high we went straight to C2 and had a few days there, incorporating a visit to C3, and then after a rest at BC (and some high altitude specific medical training and oxygen protocol preparation) we were ready for the summit push. One other thing I’d mention is the level of support that we provide. you and take you to The South Col the next day. We have excellent logistics on the mountain and there is a lot of help from the Climbing Sherpas. Because of the extra altitude involved on Everest I adopt a slightly different approach than when on Ama Dablam and have a lot more assistance from the Sherpas – this makes a big difference not only because of the extreme altitude but also because of the longevity of the trip. For instance we get sleeping bags carried to C1 when we go and camp there and then they are also carried for us to C2 when we move base to 6,400m. We then leave the bags at C2 when we drop down to BC, as we don’t anticipate using C1 again the next time. Having said that, if people get to C1 the second time on the way to C2 and decide that they need to stay there again we’d then get sleeping bags sent back down from C2. On the summit phase, bags are carried when we go and sleep at C3 and the Climbing Sherpas then drop back down to C2 for the night. The next morning they then reappear to carry bags on up to The South Col. On top of that suits and boots are also carried directly to C2. So as you can see you are ‘merely’ concerned with being self sufficient on a daily basis (layers of clothing, suncream, hydration, gloves, glasses, camera etc) rather than overdoing it physically and jeopardising yourself for the main event. But don’t read this and feel that it detracts from the experience and effort required. 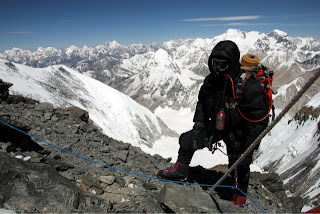 Everest is a tremendous challenge and it would be totally false economy for people to feel that they should be paying less and carrying more – all that happens for most people is that it severely reduces their chances of success and dramatically increases their chance of becoming a liability to themselves and everyone around them. And therefore a liability to the rest of the team and perhaps jeopardise the summit bid for their fellow team members. Then there are the Climbing Sherpas to consider – they are the guys who will get involved in mounting any kind of rescue bid and we owe it to them, and their families, to go to the mountain with a responsible and pragmatic approach. Summit day – above The Balcony. On top of all this I provide a truly 1:1 experience. There are some teams who quote 1:1 – and whilst that means that they have a Climbing Sherpa for every member … it doesn’t necessarily mean that they are together on the mountain just that they are on the hill in different locations! are in the same place at the same time for summit day. With our team you have a Climbing Sherpa assisting to get to C3. 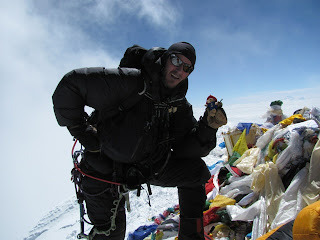 You then have a Sherpa with you up to The South Col (we may have set off ahead of them but they’ll soon catch up!). But on summit day your Climbing Sherpa is then glued to your side. He carries your spare oxygen and stays with you throughout the night and the day and constantly monitors your flow rate, your O2 reserves, your pace, the time and will keep reminding you to eat and drink. 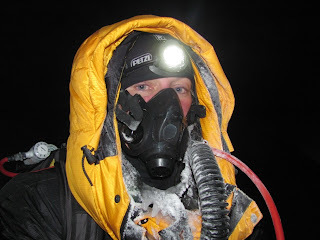 On top of that we also have spare oxygen on summit day as well as a spare mask and regulator. Your Climbing Sherpa will then stay with you all the way back down to The South Col and on down to C2 (if you stay at the South Col so will he). After a night at C2 your Climbing Sherpa will also stay with you back to Base Camp and only then will he be relieved of his guiding duties. I believe that this is what 1:1 should mean. In addition to this we all have radios to maintain contact on a daily basis, which allows for a great degree of flexibility as well as extra safety, and we all carry high altitude medical kits (and not only that you and the rest of the team will know what’s in there, what it’s for and how to use it) as well as having a great understanding about AMS, HACE, HAPE, frostbite, hypothermia, oxygen protocols etc. By the time I’ve finished with you all you’ll be with a very, very well trained team! but also one of the only teams who knew what was in the kit, what it was for and how to use it. One final thing to remember is that with some trips you don’t get a Western leader or even a point of focus. I truly believe that the Climbing Sherpas are awesome … but without direction and focus things can be overlooked or go slightly awry. Without a central focus the logistics can start to fall apart ever so slightly – and this can become a huge, HUGE problem higher on the hill when contingencies are not accounted for and suddenly there is no safety net. On the north side in 2005 a guy on a cheap trip arrived at his team’s top camp to find that there was no stove, no gas, no pans and no food. He came over and asked for all of this from us and if we hadn’t been there I don’t know what would have happened. He also didn’t have a lighter and even asked us for extra oxygen. Clearly not only had he not thought it through himself but his team (11 people from all sorts of different countries but without a leader) had also not thought about anything other than themselves as individuals. One final thought … It’s only a rich man that buys a cheap suit.